There's something so magnificent about an idea whose time has come. The idea that as a population, we do not need toxic injections of anything in our bodies to prevent disease. More front-line workers, medical staff, nurses and hospital employees are saying no to vaccines more than ever reported. An overwhelming majority of pregnant women are also now refusing the jab over fears it will harm their fetus after scientific evidence has conclusively linked miscarriages to the flu vaccine. Despite a marketing campaign for the jab and and flu-shot blitz in recent weeks, large percentages of hospital employees are refusing to be vaccinated. The Ottawa Citizen reported that 43 per cent of the Ottawa Hospital’s 12,000 employees -- including nurses and other front line staff -- have not been vaccinated. The hospital’s unions now have specific language in their contracts forbidding management to force workers to get vaccinated. The hospital has surveyed staff in an effort to discover why so many are reluctant to get the flu shot. 1. A belief that the vaccination doesn’t work. 2. Worry that the vaccination will give them flu. 3. A fear of side effects. In the past two months, at least 15 nurses and other hospital staffers in four states have been fired for refusing, and several others have resigned, according to affected workers, hospital authorities and published reports. The Wichita Eagle reported that in Rhode Island, one of three states with tough penalties behind a mandatory vaccine policy for health care workers, more than 1,000 workers recently signed a petition opposing the policy, according to a labor union that has filed suit to end the regulation. That assertion is now widely disproven as the flu shot has been exposed to have very little or no success in preventing the flu. The influenza vaccine has been found to have a maximum success rate of 6.25% which is a pretty big under-achievement, considering that the average reaction to placebo injections of distilled water is 30%. The goal the flu season has recently been exposed as one big scam perpetrated by national and international governments to promote intense influenza vaccination programs causing a perpetual cycle of illness timed every year when populations have the lowest vitamin D levels and consequently decreased resistance to infection. This year, the 2012/2013 season offers three out of six flu vaccines which contain thimerosal and all are FDA approved. The medical also community continues to be on damage control pushing out flawed studies in an attempt to sway opinion in a losing battle for control over fetus health. More than 90% of all expecting mothers will now say no to the flu vaccine due to fear of miscarriage and delivery of toxic byproducts to their unborn child. 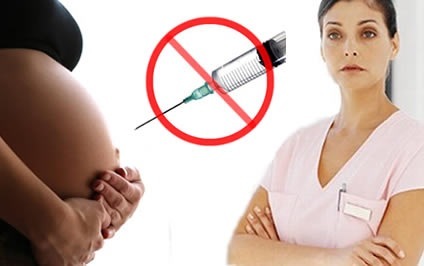 A shocking report from the National Coalition of Organized Women (NCOW) presented data from two different sources demonstrating that the 2009/10 H1N1 vaccines contributed to an estimated 1,588 miscarriages and stillbirths. A corrected estimate may be as high as 3,587 cases. NCOW also highlighted the fact that the CDC falsified reports ignoring all cases related to miscarriages from the H1N1 vaccine. Goldman's study now published in the journal Human & Experimental Toxicology showed a 4,250% increase in fetal deaths according to Vaccine Adverse Event Reporting System (VAERS) data when comparing three consecutive influenza seasons. Typically, even so-called "complete" studies conducted by the CDC have been shown to miss from 10% to 90% of the actual cases because of under-reporting. Pregnant women have a well-established antipathy toward vaccinations, with past averages calculating that only 15% getting the flu vaccine in any given year, compared with 30% of the general population, according to CDC reports. Moreover, pregnant women distrust medications in general -- even though conventional medicine insists that flu vaccines could prevent or mitigate infection should they be exposed. "Pregnant women have an incredibly strong maternal instinct and they will not submit their child to anything that could even possibly be of harm," said midwife Naomi Kates. A sizable portion of reproductive-age women are not convinced of the value of any type of vaccine, said Dr. James Moran, chairman of obstetrics and gynecology at Saint John's Health Center in Santa Monica. Listed below are links to blogs that reference this entry: Front-Line Workers and Pregnant Women In Droves Shun Flu Vaccine. This page contains a single entry by Toni published on January 16, 2013 12:22 PM. Vaccinating Healthcare Workers Doesn’t Help Patients: Cochrane Study was the previous entry in this blog. Avoiding Complications and Death from Influenza is the next entry in this blog.